A figure sits under a tree in a trance-like or meditative state. The figure sits with legs and arms folded he has shut himself off from the world and has become totally self-absorbed. The cloud which is presenting the Fourth Cup symbolizes Spirit. a release from his depressive mood. Right now he just wants to be left alone in his state of moodiness or depression. He finds neither interest nor pleasure in anything, he’s distant and aloof. No optimism! Or it’s the Hung-over after the Three of Cups…party? This tall tree behind the figure assists him in this process for if we look close we can see that he has chosen to position himself among its roots. There he will draw upon the comforting stabilizing energies of Earth while he connects with his Higher-Self to regain his emotional strength and stability. 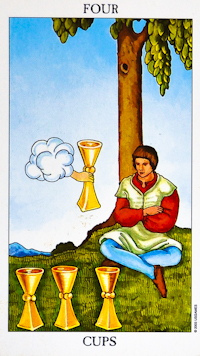 The Four of Cups can suggest a time when you just want to be alone with yourself and your thoughts. You need to spend some time meditating on this as you may need to make some changes in your life so that you can feel emotionally stable once more. Changes could involve moving away from a certain lifestyle or circle of friends that are having a negative effect on you, a partner who does not bring out the best in you or a career that makes you unhappy. You really need to take yourself in hand and get a bit of control back as life is passing you by. You are bored at the job, no motivation! Has the engagement being called off or the Wedding? May be he discover infidelity? In a relationship spread the Four of Cups suggests that one has withdrawn from a relationship and is hard to reach. This could be physically, emotionally or mentally. The Four of Cups often represents hurts, upsets and being totally disillusioned by those around you but especially by a relationship you thought meant something very special. The Four of Cups It is a warning flag to couples to spice up their relationship before it is too late. Detached- Boredom- Apathy- Disinterest- Daydreaming- Depressed -Hung-over- Blues and moodiness.